This 6.2 mile hike includes an overlook, a great AT overnight hut, and plane wreckage. Taking in the view from the Glass Hollow Overlook. It was really hazy and we were facing the sun, so the photos aren’t great. But, it was still really colorful and pretty. Below: Adam takes the turn onto the Appalachian Trail; The Paul C. Wolfe Shelter; Adam walks along the Albright Trail. Today was our 14th wedding anniversary, so we decided to take the day off of work and go for a nice hike together. It is a good sign that it doesn’t seem like 14 years and that time has flown. I’ve seen a card that said on the outside “Thank you for five wonderful years of marriage” and on the inside it said “Happy 25th Anniversary”. We’ve had some great years together. It was wonderful to pick a beautiful fall day to experience together. While Humpback Rocks is the more popular hike that departs from this spot, we thought it would be a good idea to talk about this other hike that takes off from the Humpback Rock parking lot. So, if you’re interested in hiking but not tons of people, this may be an option for you. 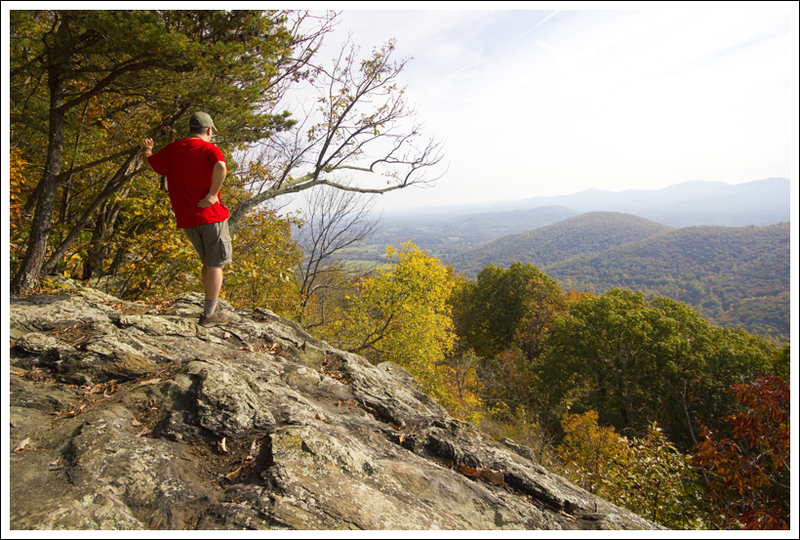 The views are better from Humpback Rock, but you do get some benefits on this hike also. After parking in the lot, you will see a picnic table adjacent to the first parking spot. There are two trails that take off from this spot. Take the blue-blazed trail to the right of the picnic table that descends into the woods (you’ll return from the loop by the Albright Loop Trail on the left). 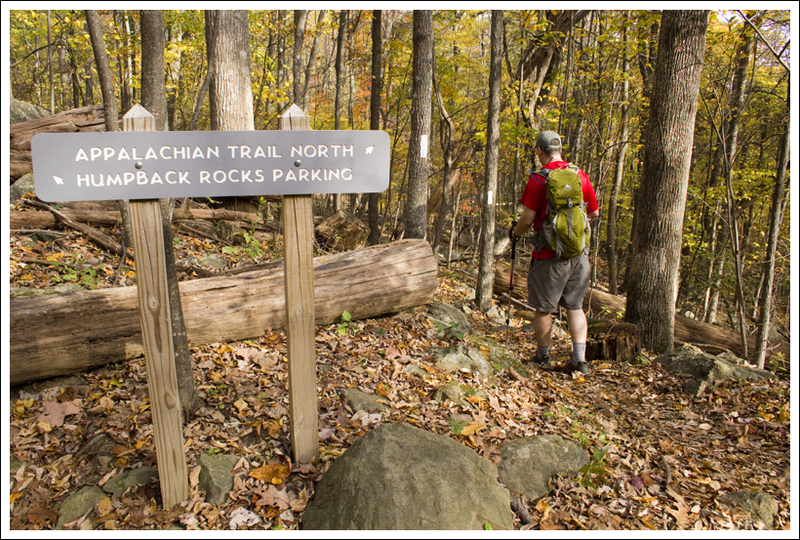 The trail descends gradually and at .25 miles, you reach an intersection with the Appalachian Trail. Take a left on the white-blazed AT heading north. The trail at this point is relatively flat or downhill. At mile 1.1, you reach an intersection with a small blue-blazed trail that veers off to the right pointing to the Glass Hollow Overlook. The trail to the overlook is just about .2 mile and is worth the walk. At the overlook, there is a backcountry campsite for those that would like to camp and take in the views of the sunrise from the overlook. Go back on the spur trail the way you came and join the AT again, taking a right and continuing north on the trail taking your mileage to 1.3 miles. At mile 1.6 and 1.7, you come across intersections with the Albright Loop trail. Just continue on the Appalachian Trail. 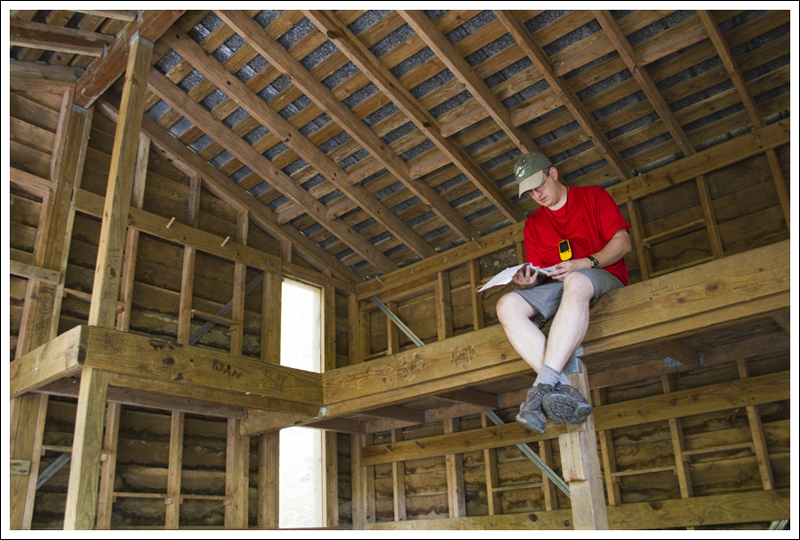 Adam checks out the shelter log in the Paul C. Wolfe shelter. Below: Past campers debate (in graffiti) the philosophy of Christopher McCandless from ‘Into the Wild’; We found a name we knew in the shelter log; On the hike back up from the shelter, we got an open view of Bears Den Mountain in Shenandoah National Park. You can’t tell in this photo, but there are radio towers atop the mountain in the distance. The trail begins to descend for the next 1.3 miles through a long series of switchbacks. At mile 3.0, we rock-hopped across Mill Creek and reached the Paul C. Wolfe Shelter. 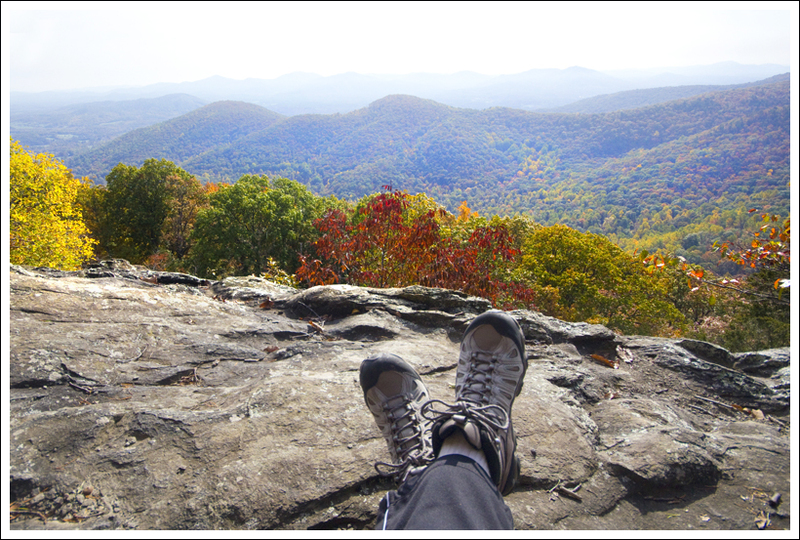 We took some time to rest here before we returned the way we came on the Appalachian Trail. We climbed back up the Appalachian Trail from the shelter heading south this time and back up the switchbacks we had just experienced. We were both glad that these took off some of the difficulty of the elevation climb. At mile 4.2, we reached the first junction with the blue-blazed Albright Loop Trail. Take a right here and you will follow this trail 2 miles back to the parking lot. The hike on the Albright Loop trail starts off very manageable, but ends up being the most difficult part of the hike since there is quite an ascent up through some switchbacks. On the return on the Albright Loop Trail, immediately after the second switchback, look up the hillside to see the wreckage of a Beechcraft Bonanza plane. On the trail it was marked with a cairn to show where you can leave the trail. The plane crashed back in 1963. Please respect the wreckage and leave it as it is. 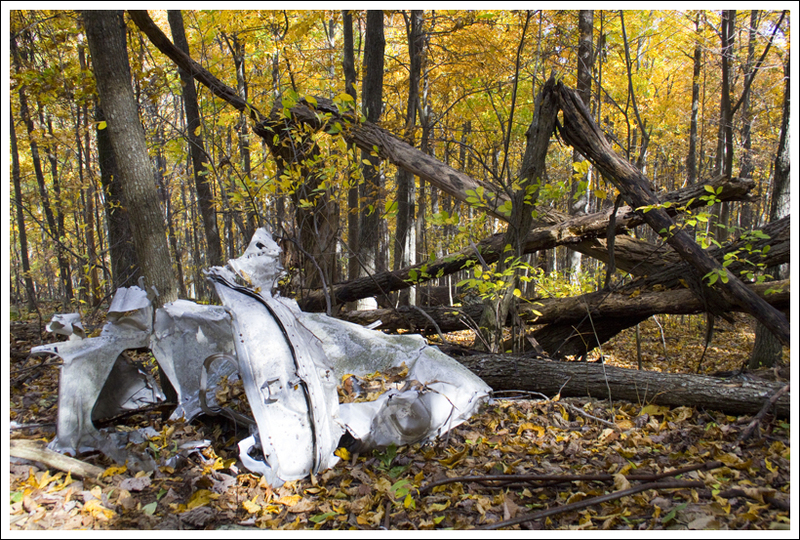 Plane Wreckage along the Albright Trail. Below: Adam checks out another section of the plane. 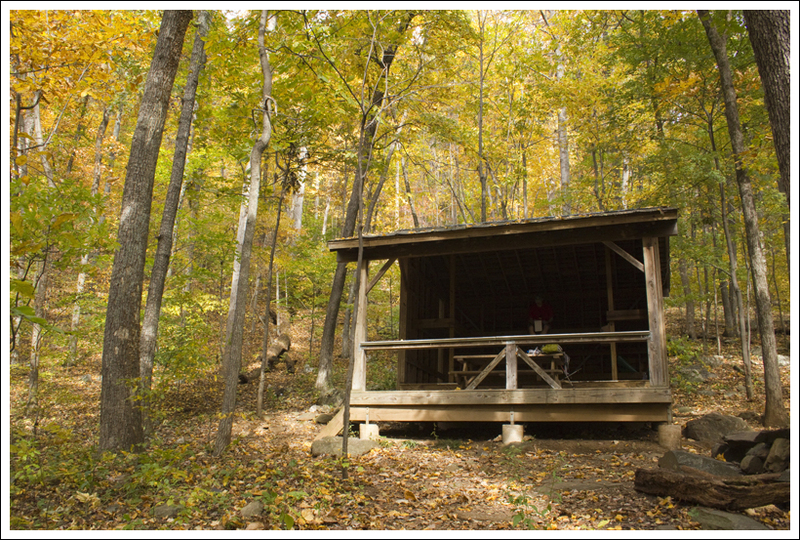 The Paul C. Wolfe Memorial shelter was built by the Old Dominion Appalachian Trail Club in 1991. According to their website, “it took approximately 30 people every weekend for two months to complete the shelter. Materials were hauled two miles by hand and tractor.” This is one of the nicest huts on the AT, according to a lot of the thru-hikers. It really has nice construction and a beautiful location. After our hike, we made a quick trip down to Sonic for a snack (tots and creamslushes!). We didn’t want to spoil our anniversary dinner though, since we had reservations at The Local Chop & Grill House in Harrisonburg, VA. It always feels good to have a guilt-free dinner when you have burned off a lot of calories on a hike. What a great anniversary hike! I love being out on the trail during the peak of fall foliage season. 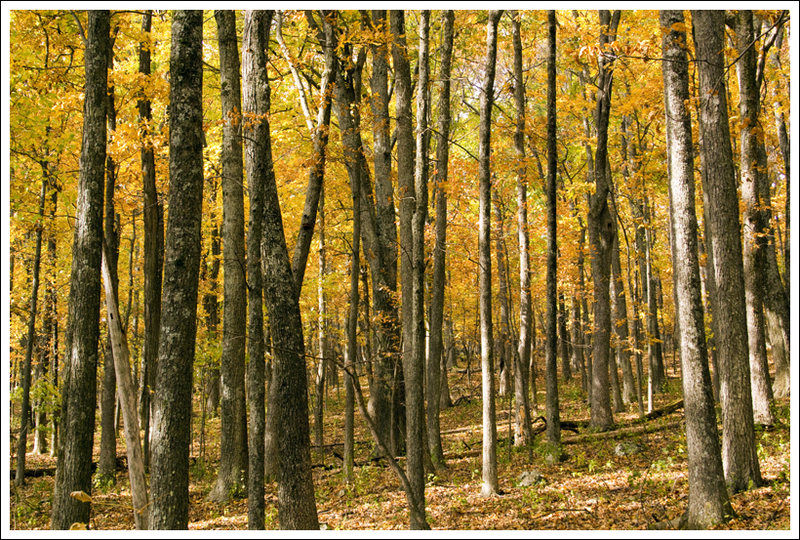 All during the hike, the sun was filtering through the trees above – making a gorgeous canopy of gold. There were also plenty of brilliant red maples tucked into the understory. What was even better — no crowds! Hiking on a weekday on a less well-known trail made this hike especially enjoyable. I had new boots to try out on this hike. Right out of the box, my Oboz Sawtooth boots were perfectly comfortable. They’re the first taller pair of boots I’ve ever worn. I was skeptical about that, but they felt great the whole six+ miles. A golden canopy of forest. 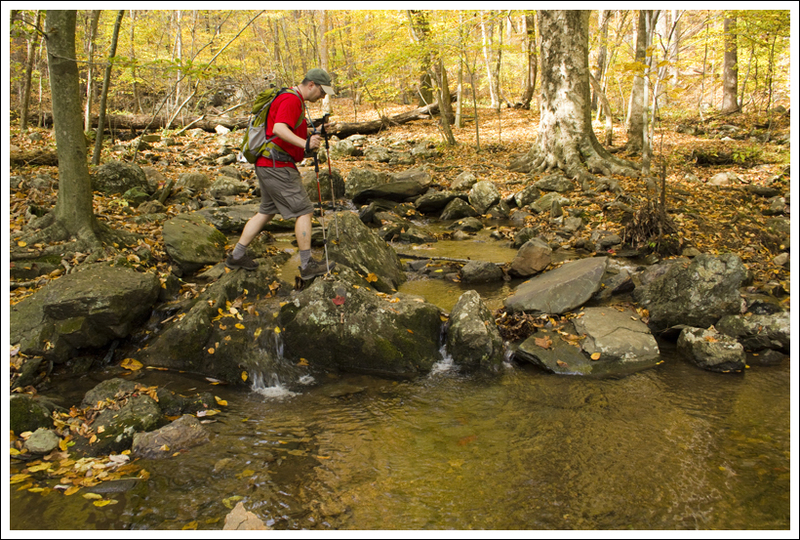 Below: New boots on the Glass Hollow Overlook; Adam crosses Mill Creek; A small cascade on the stream. Since Adam has already talked about the trail specifics, I’ll just share a few of my highlights. One of my favorite stops was at the Paul C. Wolfe shelter. It really is one of the nicest backpacking shelters I’ve ever seen – two levels, plexiglass windows, hooks to hang backpacks and a deep, well-sheltered porch, so you always stay dry when you’re sleeping. The structure is set uphill, overlooking a wonderful, babbling stream. 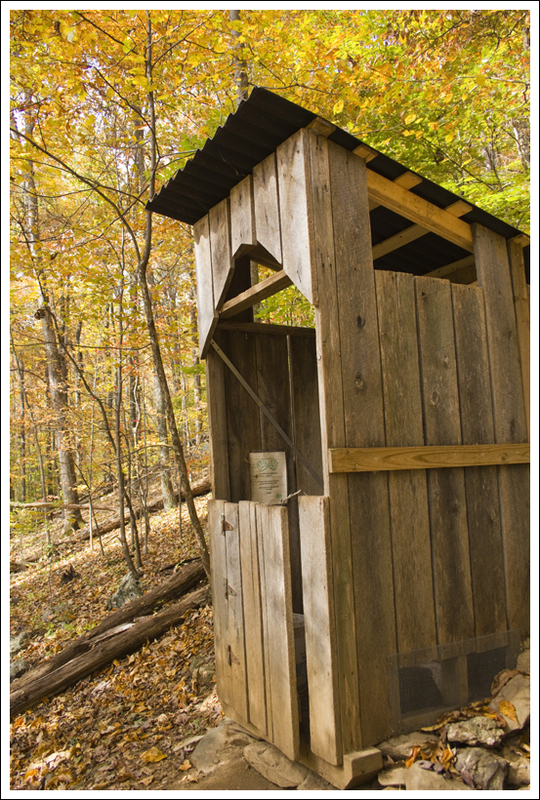 Even the privy is unique at this shelter. With it’s half-door, I can’t say you’ll ever get true privacy, but at least you know when it’s occupied and the ventilation couldn’t be better! While we were taking our break at the shelter, we took a few minutes to flip through the log book. 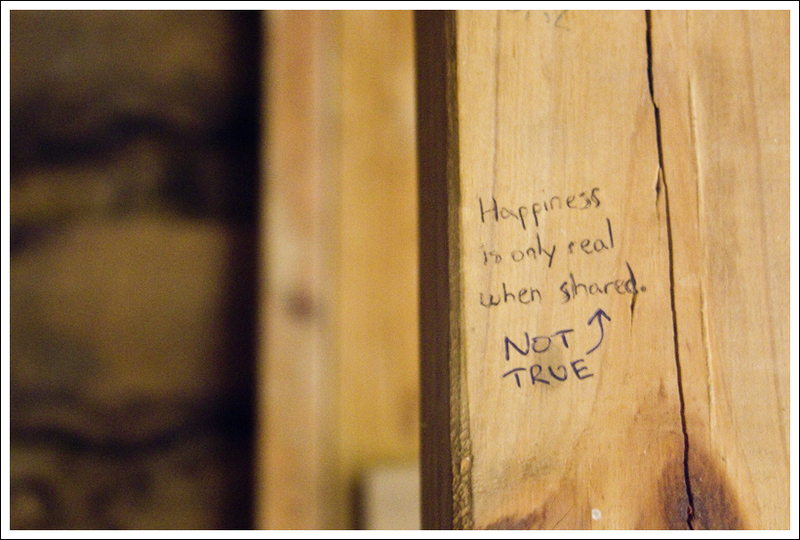 We noticed the entry from one of the backpackers we met in September at the Pinefield Hut. It was kind of neat to see a name we knew. I also took some time to explore and photograph the stream. Along the bank of the stream, there is a marble bench placed in memory of John Donovan. He was an experienced hiker and a member of the Old Dominion Appalachian Trail Club. He died on his attempt to thru-hike the Pacific Crest Trail in 2005. The bench gave me enough information to Google his name so I could learn more about what happened. 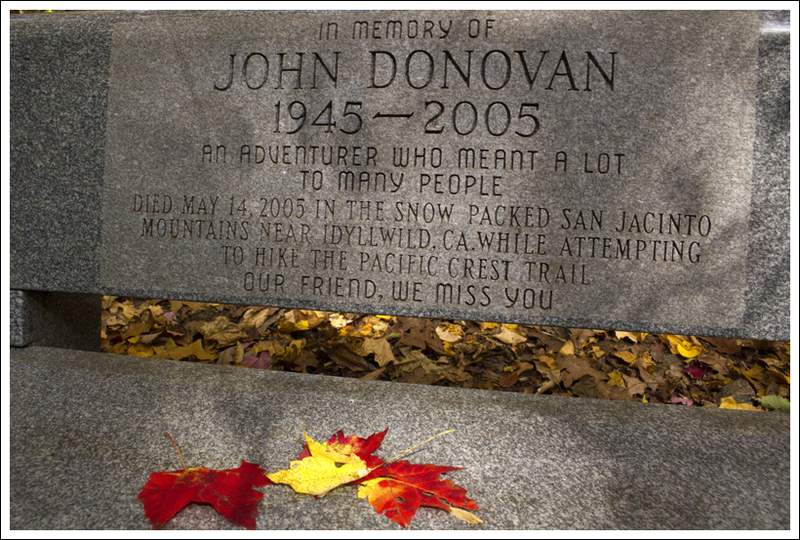 As it turns out, Backpacker Magazine published a long feature story about John Donovan’s disappearance and death in a 2006 issue. It was a fascinating read! The tragedy that befell Donovan turned into a miracle that saved two other lives. A bench is placed in memory of John Donovan. Below: The privy has a half door! The plane crash was an interesting stop, too. 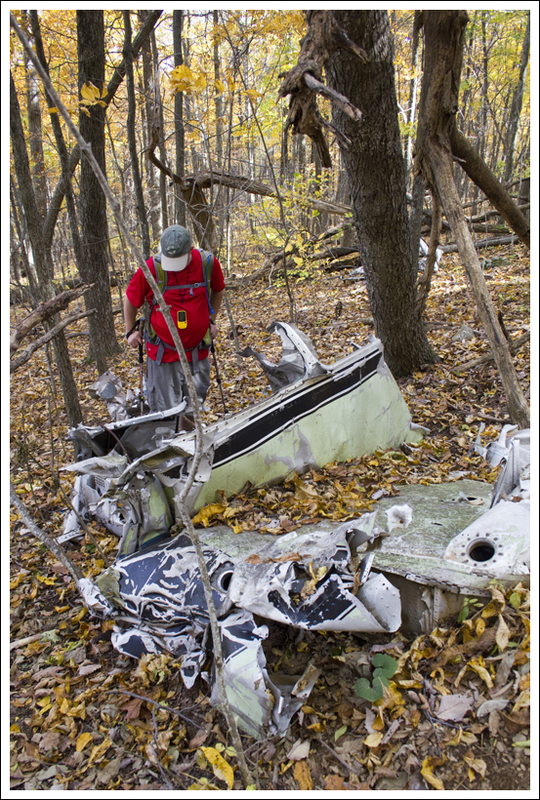 I expected the plane wreckage to be a lot rustier after close to fifty years in the woods, but it was still completely recognizable as an aircraft. I couldn’t find anything more about the crash other than the year it happened and the type of plane. After leaving the plane site, we finished out stint on the Albright Trail and made our way back to the car. The parking lot was really full, but pretty much everyone else was on the Humpback Rocks trail. I’m really glad we took the time to explore this trail – it turned out to be a perfect way to celebrate our anniversary. Elevation Change – 1500 feet. Difficulty – 3. There is a good amount of uphill climbing. The steepest section is along the Albright Loop Trail. Trail Conditions – 4. The trail is nicely maintained. 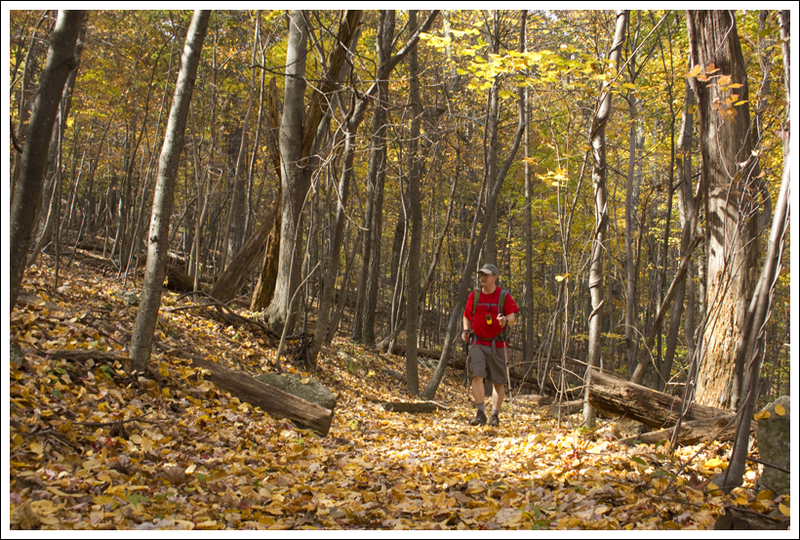 During the fall season, be sure to watch your footing if the trail is covered with leaves. There are loose rocks underneath a good portion of the trail. Views –3. The best unobstructed views are from the Glass Hollow Overlook. 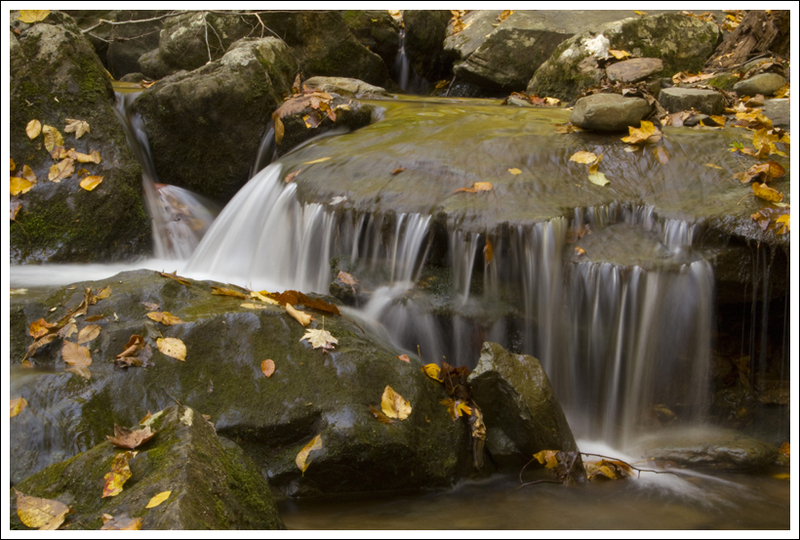 Streams/Waterfalls – 3. Mill Creek was moving nicely near the shelter. According to a journal entry from an AT hiker, there is a small waterfall and pool shortly downstream. Wildlife – 1. We didn’t see anything beyond birds, chipmunks and squirrels. Ease to Navigate – 3.5. There are a few intersections, but there are also signs at each of the intersections. Solitude – 3. 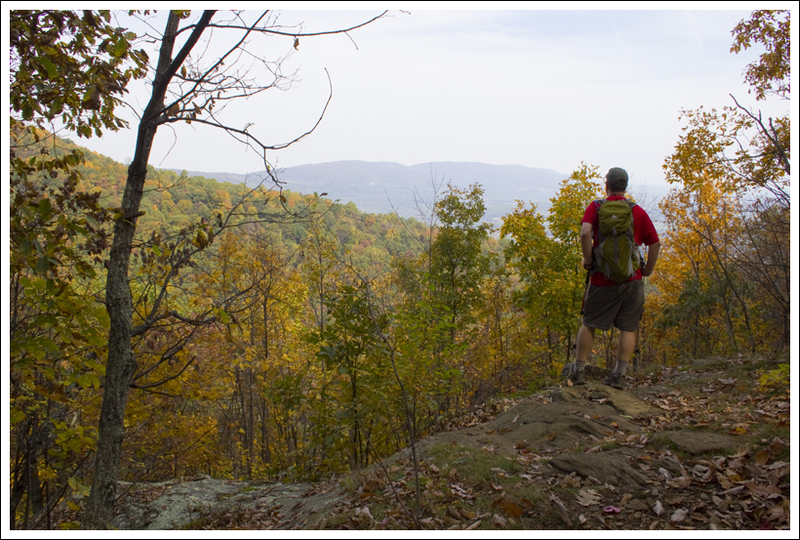 You will likely run into a few others on the trail, due to the proximity of Humpback Rocks. Directions to trailhead: The trail is located on the Blue Ridge Parkway at Mile Marker 8. The hike begins on the blue-blazed trail to the right of the picnic table. Have you guys been back on this trail recently? If so, do you know if the backcountry campsite is still present at the Glass Hollow overlook? I’ve read a few other reviews (yours is the best!) but none of them mention it, just wondered if it has grown over from lack of use. Hi Amanda! Thanks for visiting. The last time we were by Glass Hollow was in 2013 when we hiked the AT section from Dripping Rock to Rockfish. At that time, the fire ring had been dismantled, but it was still evident people had camped there recently. Was there today and a pretty good fire ring has been built again. Excellent description of the trail, as always; particularly of how to find the plane wreckage. I’ll add that the steepness of the trail is toughest for the first mile on your way back up from Mill Creek, and on the mile immediately after the plane crash site. Thanks for the visit, Jerome! I’m glad you found the wreckage. Great site! 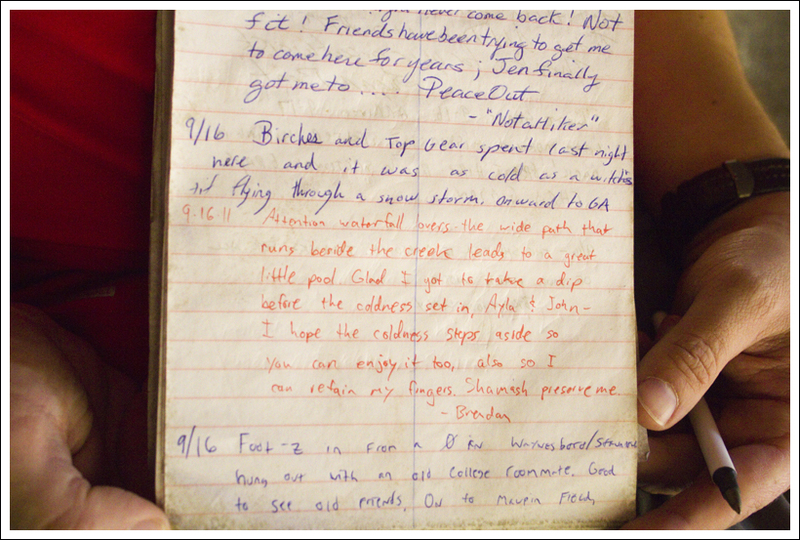 Your interesting notes, photos and trail details are very helpful. I often read about your hikes when I am planning to hike the same trail or just to get good hiking ideas. Thanks. Hi! I really like your website and appreciate the time and effort you put into your writeups and photos. I just wanted to offer a quick correction about the Glass Hollow Overlook: it faces East, not West. It makes a very nice spot to watch sunrise over the Rockfish Valley. Thanks for the correction, Brandon! I really love the golden canopy shot, it and all your others make me wish I lived a little further inland so I could head to the mountains on a whim. Congratulations on 14 years, we celebrate 20 on Wed., though we will not spend it hiking. As nice as that sounds, I am the only one with outdoor DNA in this marriage. Thanks for the visit, Les! Adam and I feel very lucky and blessed to live so close to the mountains we love.